Debt Negotiation, also known as Debt Settlement, can be the most cost-effective option to pay off your debts and relieve a person from having to file for bankruptcy. Debt negotiation is a proactive approach for debtors experiencing the stress of too much debt. We understand the stress and struggle of living with an overwhelming amount of debt. Debt negotiation programs can reduce an unsecured debt so that it’s affordable to pay off. If you have multiple unsecured debts that you can’t afford to pay, a debt settlement plan allows you to take control of these debts – so that you can begin living the lifestyle you’ve been dreaming about…being debt free! You have to be careful though because this type of debt relief program comes with downsides. Every program for debt relief comes with downsides, including debt settlement, validation and consumer credit counseling. The key is to explore all of your debt relief options and find the right plan for your specific needs and goals. You could end up paying only a fraction of the debt. In the example, the client’s debt was settled for around 40% of the total balance, but that was before fees. Debt settlement company fees cost 18% of the total amount of debt enrolled in the program. This program is custom-built for each client’s current personal and financial situation and level of debt in order to make the process as quick as possible and affordable for you. The credit card debt negotiation process has been tested and developed over the years by the different servicing companies that we’ve partnered with. Golden Financial Services refers to legal counsel and thoroughly investigates each debt relief backend provider before we start referring clients to that backend. We want to make sure that anyone who uses Golden Financial Services for debt settlement advice, gets the best possible recommendation and plan on how to get out of debt quickly. Through the established relationships that our servicing company has with the creditors and financial institutions, they’re able to successfully negotiate the debts of our clients at a substantial discount. Creditors are willing to negotiate a debt with our servicing negotiators, on behalf of our clients, with the understanding that the settled amount will be paid in a timely manner. Furthermore, creditors are always looking to avoid the ineffective and costly efforts of an outside collection company. Our servicing partners continually develop strong relationships with creditors throughout the country. The debt negotiators are always maintaining a very professional and cooperative relationship with the creditors in order to reach the most favorable debt negotiation settlement. Debt negotiation services reduce your debt Vs. consolidation options that only reduce the interest rates. This approach also assists you by reducing the time it takes to repay your debt. Debt negotiation is a way to get out of debt in the shortest amount of time, and with the least amount of money without filing for bankruptcy. There are some drawbacks though. The IRS considers a forgiven debt as taxable income, so at the end of the year, they will expect taxes to be paid on the settlement. The IRS, however, has a form (#982) available for special hardships. With debt consolidation, you get a loan to pay off your debt. By paying off your debt with a loan, your balances get “paid in full”. Debt consolidation is more costly than debt settlement but better for your credit score. Debt consolidation does not usually affect a person’s credit score in a negative way like with debt settlement. Debt settlement is aimed to help someone with a financial hardship, while debt consolidation is geared for someone with a high credit score and who are not suffering from a financial hardship in any way. Before settling a debt, it can be disputed through debt validation. Debt validation forces third-party debt collection agencies to prove that the debt is valid. providing their debt collection license to collect on a debt in whatever state you reside. all of the accurate paperwork, including documentation to prove the debt is yours and adds up to what they allege you owe. 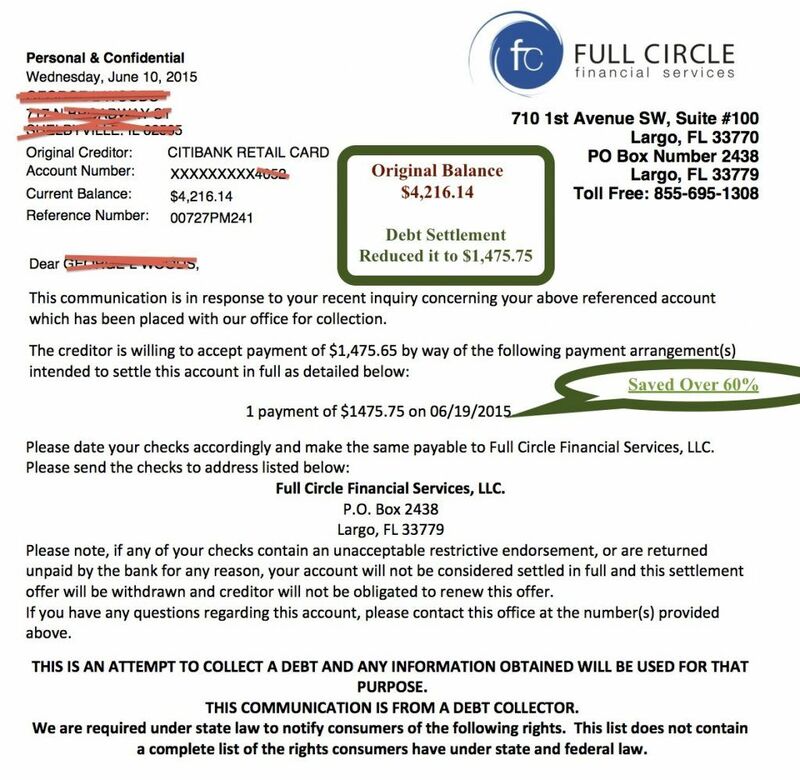 all of the complete documentation that laws require debt collection companies to maintain, such as accounting records and the original agreement that you signed with your original credit card company. Often, debt collection companies can’t prove a debt to be valid and the debt becomes legally uncollectible. A legally uncollectible debt is one that you don’t have to pay. Debt validation can dispute your debt and in some cases get it off your credit report. Can I Negotiate Debt on My Own? Can you file your own taxes? Do you file your own taxes? Most people don’t. In many cases, it can be cost-effective to hire an accountant to file your taxes. Accountants are familiar with the tax laws. A debt negotiation program is similar to using an accountant. The only difference is that instead of trying to save you money on your taxes, a debt negotiation plan will focus on saving you money on your unsecured debt. A reputable debt negotiation company uses the laws and experience to settle a debt – and get you the largest possible discounts on your debt. You can settle your own debt. Learn how to settle a debt on your own by visiting this page next. Some financial institutions have what is called an offset-clause related to business accounts. The clause states that if you are to default on your payment with any credit accounts and have an active bank account with the same creditor, the creditor can seize funds from you. If you don’t remember whether or not you signed this document, please either review your contract with your financial institution, or open a new bank account. 2. Student loans can be settled if they are not government backed, but they cannot be discharged in bankruptcy and they can garnish your wages 15% of your net pay without a court order. 3. If a client is “active military”: This debt negotiation program may have a negative effect on your credit, that negative affect may conflict with your security clearances. This can easily be resolved by a simple conversation with your commanding officer or we can provide you with a letter explaining that you are in a debt negotiation program and the impact it will have on your credit. Furthermore, if you do not wish to notify your commanding officer of your involvement in this program they may still be alerted by the negative impact on your credit score. 4. Golden Financial Services does not clean up, fix, or repair credit, but once a settlement has been completed, you will no longer owe that debt and your credit report will reflect a zero balance for that account. Does debt negotiation affect your credit score? The debt negotiation program will have a negative effect on your credit while on the program since your creditors will not be paid on a monthly basis. However, your credit score can be rebuilt easier than if you were to have filed for bankruptcy. Learn more about how a debt settlement program can affect your credit score. 5. Golden Financial Services cannot stop interest, late fees and penalties that may accrue on your accounts during a debt negotiation program, but we will settle for the full amount listed by your creditor at the time of settlement. Your monthly payments in the debt negotiation program will not change based on the change in your balances from the creditors. There are fees charged for the program, but they will be included in your monthly payment. 6. You should be aware that any amount over $600 which is forgiven at the time of settlement may be taxable by the IRS. You may receive a 1099-C form from you creditor at the end of the year for the account that has been settled, ask your CPA or tax professional to review this. The IRS may also allow you to be able to exclude the tax as “income” if you are insolvent. 7. Your creditors could take legal action while you are in the debt negotiation program. If this happens, it is important to send over any paperwork to Golden Financial Services immediately or the law firm that we set you up with so that the summons can be responded to, settled and resolved before the court date. 8. ***IF CLIENT HAS LINKED ACCOUNTS ENROLLED *** Some financial institutions and credit unions have what is called an offset-clause related to accounts. The clause states that if you default on your credit account payment and have an active bank account with the same creditor, they can seize funds from you. It is suggested you close that account and open a new bank account. You will get set up with a “special purpose savings account”. This is just a savings account that we monitor but you control, that is FDIC insured, where your funds are safe. You will accumulate funds in this account for settlement purposes by making a monthly deposit. The debt negotiators will track the Settlement Funds and negotiate on your behalf based on what is available. The debt negotiation fee will be earned only when a settlement offer is accepted and completed. You will be made aware of all settlement opportunities, and if you agree with the settlement terms that we’ve negotiated, you will communicate that with your case manager and they will contact you to finalize the debt negotiation settlement. Golden Financial Services has been in the debt negotiation industry for over fifteen years. We have maintained an A+ Rating with the Better Business Bureau and have zero unresolved customer complaints. Golden Financial Services can help you with getting rid of your debt problems, and starting fresh! To set up a free debt negotiation consultation with Golden Financial Services or to learn more about our debt negotiation services call 1-866-376-9846. A debt arbitration and negotiation notation are never reported on a person’s credit report after enrolling in the program. However, the action of not paying your creditors each month is what will lower your credit score and cause your accounts to go into default. You get the biggest discount on a debt after it’s sold to a third-party debt collection agency. At this point your accounts are debt collection accounts. Having collection accounts on your credit report is one of the worst marks for your credit score. At Golden Financial Services; we feel it’s much easier to recover financially after a debt settlement program, compared to if you were to file for bankruptcy. The key is to have a complete financial plan in place before debt negotaition. You can start rebuilding your credit score and establishing new credit as your debts get negotiated down and settled one by one.